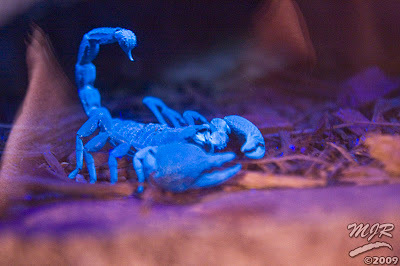 Why do scorpions floresce under UV light? No one knows. But we know how they floresce, though you'll slap your forehead when I tell you because it's so obvious. It's because of the Beta carboline and 7-hydroxy-4-methylcoumarin that emerges in the hardening cuticle of their exoskeletons of course. Newly molted scorpions don't floresce, so the florescing compounds have to be either secreted by the scorpions or else somehow develop as part of the tanning process. We just don't know. Of course, I imagine scorpions are asking each other why the rest of us don't floresce. We must look so boring to them, what with our visible light band affinity. I TOTALLY slapped my forehead! DANG!!! I coulda had a V8!!!! PS hahahaha "scorpions are so 80's" kudos to anonymous! Some animals see light in the UV range of the spectrum. There is UV light coming through the atmosphere all the time, maybe they are sensitive to it and see eachother in a different light. We dont see in the UV range so we wouldnt see it without help. There are some bird species who see in the UV range. "Scorpions are so 80's. The band, the colors, the whole black light thing..."
i didn't know that some animals saw in uv, that's wicked! and i think my friend would freak out about the birds..
and how is that i know most of the animals shown? We have scorpions (small ones thank goodness)in our home during the summers. We usually find about 10 to 15 each year and I never knew this. Do all of them appear this way?